Jeffrey C. Lagarias. Euler’s constant: Euler’s work and modern developments, Bull. Amer. Math. Soc. (N.S. ), 50 (4), (2013), 527–628. MR3090422. Clifford Ambrose Truesdell, III. An idiot’s fugitive essays on science, Methods, criticism, training, circumstances. Springer-Verlag, New York, 1984. MR769106 (86g:01060); and Great scientists of old as heretics in “the scientific method”. University Press of Virginia, Charlottesville, VA, 1987. MR915762 (88m:01038). Always attack a special problem. If possible solve the special problem in a way that leads to a general method. Read and digest every earlier attempt at a theory of the phenomenon in question. Let a key problem solved be a father to a key problem posed. The new problem finds its place on the structure provided by the solution of the old; its solution in turn will provide further structure. If two special problems solved seem cognate, try to unite them in a general scheme. To do so, set aside the differences, and try to build a structure on the common features. Never rest content with an imperfect or incomplete argument. If you cannot complete and perfect it yourself, lay bare its flaws for others to see. Never abandon a problem you have solved. There are always better ways. Keep searching for them, for they lead to a fuller understanding. While broadening, deepen and simplify. Choose a mathematician whose work is somehow related to calculus. The connection may be loose (of course, Newton or Leibniz qualify, but so does John Nash). To avoid repetitions, email me your choice, and I’ll let you know whether your choice has not yet been claimed. Write (well, type) an essay on their life and mathematical work. It may be short. Make sure to follow reasonable standards of style when citing references, etc. Due December 2 (after Thanksgiving break). It is easy to see that to show that is countable, it suffices to show the countability of , or even of . Given any (injective) sequence of reals, we want to exhibit a real that was not listed. There are two cases: Either there are with , and such that there is no with , in which case we are obviously done, or (more interestingly), whenever , we can find an strictly in between (the range of the sequence is dense in itself). Assume we are in this situation. For definiteness, suppose that . The other case is treated similarly. Let be , where is least such that . Then define as , where is least such that . In general, given , we define as , where is least such that , and then define as , where is least such that . Note that these sequences are well defined, because of our density assumption. It turns out that if we carry out Cantor’s construction when the sequence of is the enumeration of the rationals in we began with, then , where is the golden ratio. Mike Krebs, and Thomas Wright. On Cantor’s first uncountability proof, Pick’s theorem, and the irrationality of the golden ratio, Amer. Math. Monthly, 117 (7), (2010), 633–637. MR2681523 (2011e:11127). There is a very nice enumeration of with combinatorial significance. 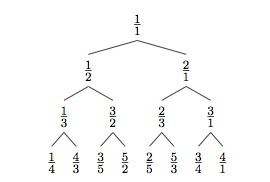 The rationals are used to label the nodes of the infinite complete binary tree, and the resulting enumeration simply follows the nodes of the tree, lexicographically. We begin by putting at the root of the tree. Once a node has been labelled , its left successor is labelled , and its right successor is latex . The numerator and denominator of any of the assigned fractions are relative prime. Every positive rational is assigned to some node. For this, one proceeds by induction. For example, if there is a fraction not in reduced form, and used as a label, pick such a fraction appearing in as small a level as possible, and note that the fraction cannot be . A contradiction is now attained by noting that . Similarly, if appears in more than one node, then , and its immediate predecessor (either or , depending on whether or ) must also appear more than once. Finally, if some fraction is not listed, we can choose its denominator least among the denominators of all skipped fractions, and then choose its numerator least among the numerators of all skipped fractions with denominator . A contradiction follows because , and if , then must also have been skipped, but , while if , then must have been skipped, but . There is a sequence of positive integers such that the -th fraction in the enumeration is just (in reduced form). In particular, the denominator of a fraction is the numerator of its successor in the enumeration. So , , , , , , , etc. In fact, is precisely the number of ways of writing as a sum of powers of , where each power can be used at most twice. For example, , because we can write as , as , or as . Neil J. Calkin, and Herbert S. Wilf. Recounting the rationals, Amer. Math. Monthly, 107 (4), (2000), 360–363. MR1763062 (2001d:11024). What can we say about the real(s) that comes out when the procedure from Cantor’s proof from section I is applied to this enumeration? 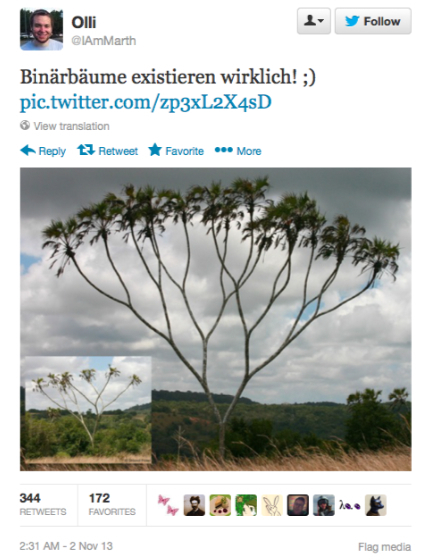 Any infinite path through the binary tree defines a sequence of rationals. What reals appear as limit points of these sequences? William Stein. Elementary number theory: primes, congruences, and secrets. A computational approach. Undergraduate Texts in Mathematics, Springer, New York, 2009. MR2464052 (2009i:11002). René Baire. Sur la représentation des fonctions discontinues. Deuxième partie, Acta Math. 32 (1), (1909), 97–176. MR1555048. Arnold W. Miller. Descriptive set theory and forcing. How to prove theorems about Borel sets the hard way. Lecture Notes in Logic, 4. Springer-Verlag, Berlin, 1995.MR1439251 (98g:03119). Arnie’s homeomorphism also has the nice feature of being an explicit order preserving bijection between , ordered lexicographically, and the set of irrationals. A few nice additional results on continued fractions, with references, are given in this blog entry. Alex Kontorovich. From Apollonius to Zaremba: local-global phenomena in thin orbits. Bull. Amer. Math. Soc. (N.S. ), 50 (2), (2013), 187–228. MR3020826. For example, consists of all numerators appearing in finite continued fractions consisting solely of ones: , that is, , so is the set of positive Fibonacci numbers. Jean Bourgain, and Alex Kontorovich. On Zaremba’s conjecture. ArXiv:1107.3776. Erroll Morris ran a series of essays on the New York Times a couple of years ago, on the topic of incommesurability. The whole series is highly recommended. You may particularly enjoy reading Part III, on Hippassus of Metapontum, the mythical Pythagorean who proved the irrationality of square root of two, and was killed by the other followers of the cult as a result. The legend is told in many places; Morris lists a few in his essay. I first found it as an appendix to Carl Sagan‘s book version of Cosmos. This set is due Monday, September 16, at the beginning of lecture. with the (standard) convention that if is empty, then . provided that the supremum exists. There is a small ambiguity here, in that if is finite, we have defined in two potentially conflicting ways. 1. Show that both definitions coincide if is finite. 2. Give an example of a sequence and a set such that is not defined. Show that for any and any , if is not defined, then neither is . and that, if this supremum exists, then so does , and the displayed equality holds. 4. Fix a positive integer . Show that if is such that, for every , has the form where then, for any , is defined, and is a number in the interval . Hopefully it is clear that all we are describing is the base representation of any number . 6. Indicate how to extend the above so any real has a base representation (for any ). 7. Given , let be the sequence with -th term for all . Show that is the only value of such that there are with Describe all such pairs . Show that for all there is some as in 4., with the same “failure of injectivity” property. The above gives us that in the sense that there is an injection . 8. Make this explicit, that is, give an example of such an injection , hopefully related to these sums we are considering. One can also show that and in fact there is a bijection between these two sets, though you do not need to do this here. As indicated in item 7., when the function given by is not an injection. 9. For this , show that the collection of sets such that there is a set with is countable. Show that if is countable, then there is a bijection between and so, in particular, even allows us to verify that . You are currently browsing the A kind of library blog archives for September, 2013.